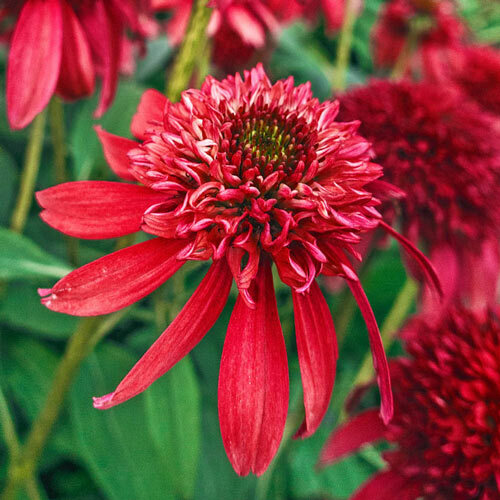 The very best double red coneflower! Flowering Date: Mid to late summer until fall frosts. 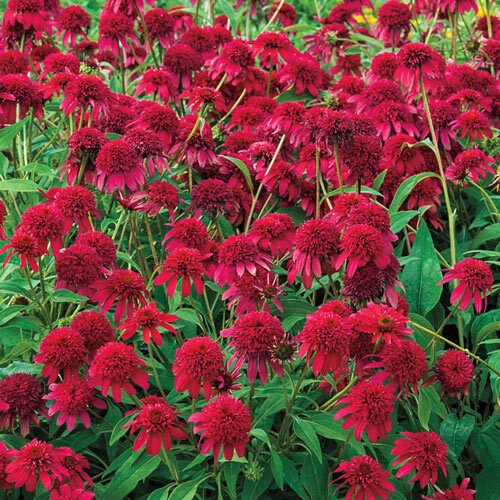 With its profusion of unique cranberry red blooms borne over an amazing 3 months, this Echinacea will knock the socks off of anyone passing by! 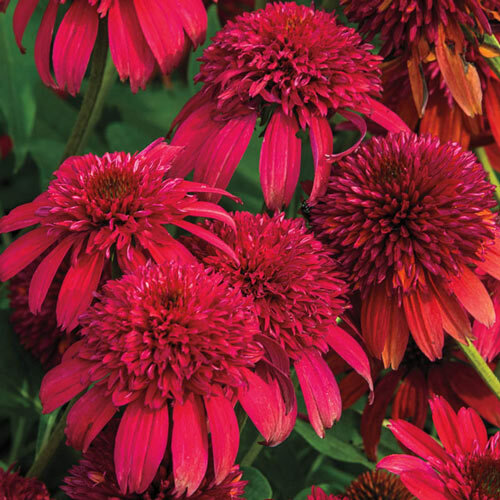 The compact plants are 24" tall and 20" wide, and have the tough constitution coneflowers are known for, taking drought, hot summers and cold winters in their stride. And the flowers' deep, rich red coloring will not fade! Deadheading will extend the bloom season, but leave late summer cones for songbirds to feast on. A top butterfly attractor, too. Zones 4-9. Ships in 3" pot. 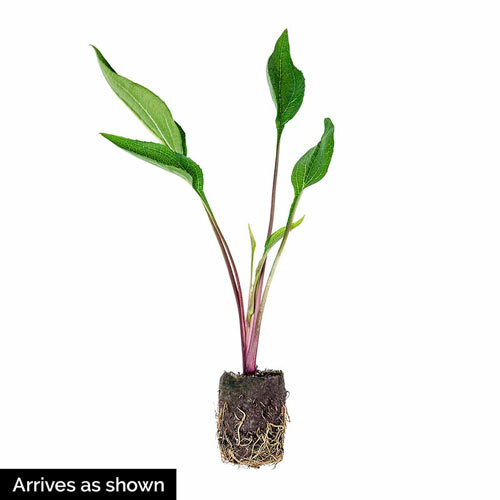 Echinacea 'Balscanery' PPAF. Full Sun. Flowering DateMid to late summer until fall frosts. Planting InstructionsWill grow in any well drained soil. Tolerant of drought conditions. Best in sunny hot locations. Flower FormDaisy like with large prominent cone centers. Foliage TypeDark green, lanceolate, coarse and hairy and toothed. Soil RequirementWell drained, average - tolerant of poor infertile soil. PruningRemove spent flower stems to encourage new blooms. After flowering. Unique CharactersticsSuch a rare color for Echinacea, this selection boasts saturated cranberry red, double pom-pom flowers that don't bleach out as they age, putting on a sizzling hot show of color in the landscape for several months beginning in early summer.The plants are very consistent and vigorous growers both in production and in the landscape. Clean, deep green foliage forms a sturdy, very well-branched, upright clump that fills out gallon sized pots well.The fragrant blossoms are long lasting in fresh bouquets and attract butterflies like a magnet.Praised for their cheerful brightly colored flowers, coneflowers are a mainstay in today's garden. Be sure to leave some spent blooms on the plants in the fall because their seeds provide winter food for finches and other birds. The dried seed heads also provide architectural interest in the winter.